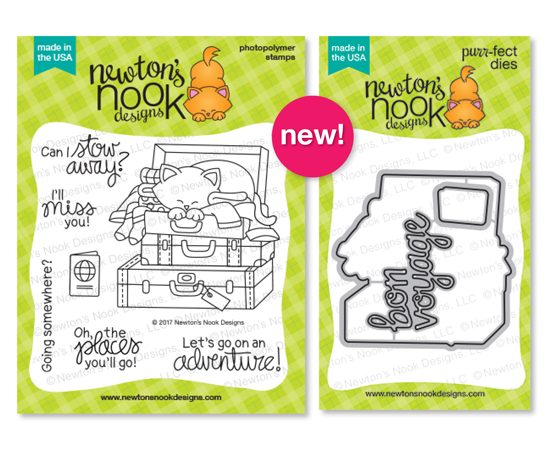 Starting today, Xyron and Newton's Nook Designs are collaborating for an awesome inspiration week! Woo Hoo!!! 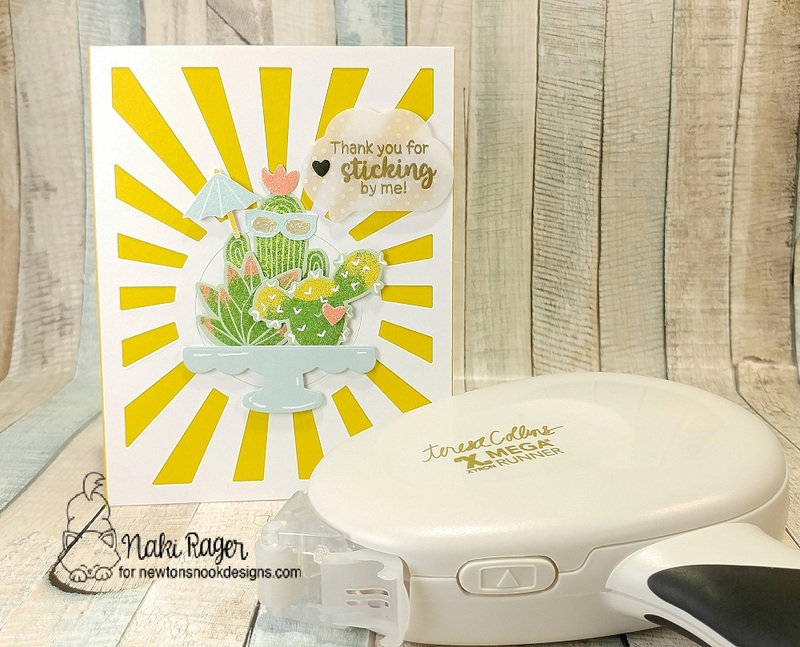 Each day there is fresh inspiration using Newton's Nook Designs products with Xyron adhesives on the NND blog and on the Xyron facebook page! If you've never heard of Xyron, they have awesome adhesives like the Mega Runner in my photo above ;-) They generously sent us our choice of their products (Thank you so very much!!!). As you can see, it is HUGE!, and basically a giant snail adhesive that everyone loves! So adhesives are sticky, right? The Cultivated Cacti set has a sentiment that says, "Thank you for STICKING by me", and that's the set I grabbed right away! Not to mention it is such a cute and versatile set! 3 of the beautiful cactus images were heat embossed and die cut with the coordinating die set, then planted on this beautiful cake stand from the Love and Chocolate die set. 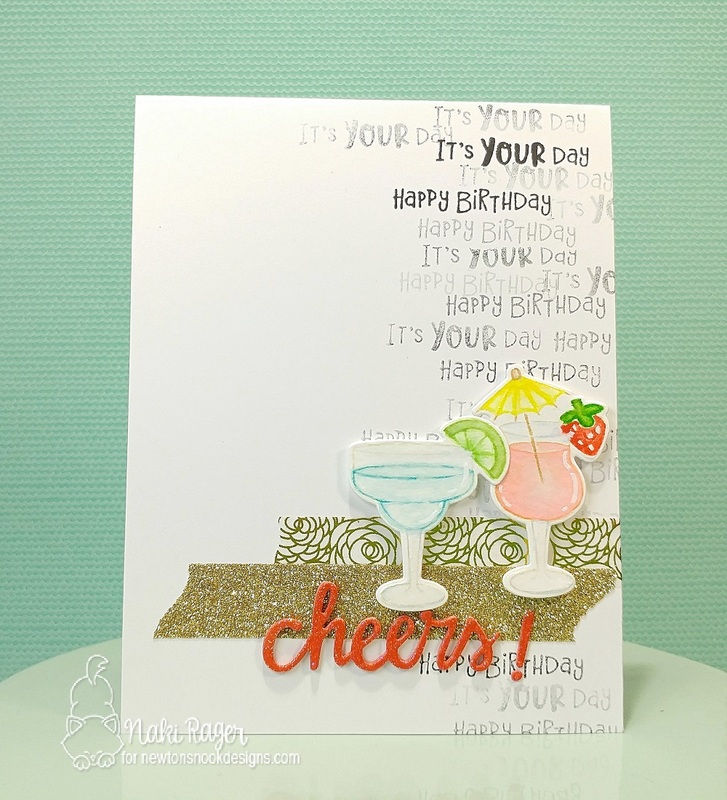 The sentiment was heat embossed with gold embossing powder on vellum with polka dots. Here's how to win:Leave a comment on the NND & Design Team blog posts using Xyron products all week (July 31 - Aug 4) to enter. One winner will be randomly chosen from blog posts throughout the week so the more posts you leave comments on the better your chances are of winning! You have until Friday August 4th at midnight CST to comment. The winner will be announced on the NND blog post on Monday, August 7th. Make sure you come back everyday and leave us your sweet comment good luck! I am up on the Newton's Nook Designs Blog with this adorable baby card today! This set comes with a lot of sentiments, I picked "welcome" and "baby" to heat emboss on vellum. I also heat embossed the duck from one of the onesie images, colored him in, and fussy cut to use as an embellishment next to the sentiment. I added the tiny cloth pin and a few enamel dots also. I die cut a strip of "xo" to add a little more color and done! This was pretty quick to make, but tons of fun to make! So recently, I won a giveaway on Instagram, and finally had time to play with it! Have you heard of the company Flora and Fauna? 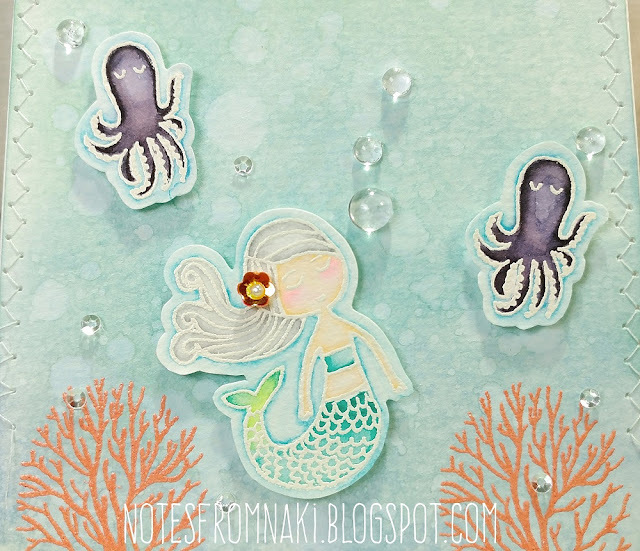 Their designs are so whimsical and lovely, I fell in love with them instantly! This Mermaid Kisses set is what I won, isn't this adorable!? I couldn't resist but to create a little scenery card! I was looking at a few challenges and MFT had this color combo: Teal, Coral, Gray, and Black, and thought it was perfect for this set! 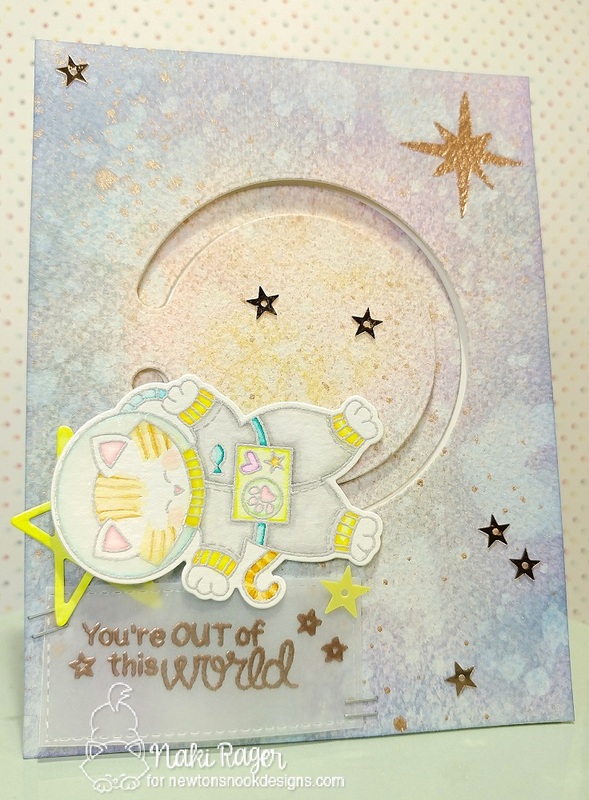 I ended up not using any of their products so not entering it but I still do like to find inspirations to start up my cards! 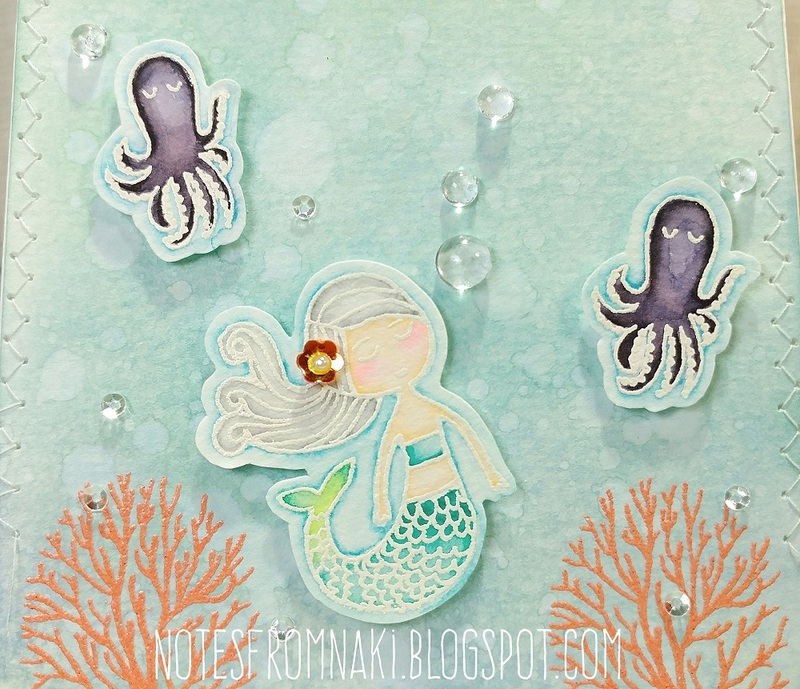 I think I'm addicted to Distress Oxide Ink, creating backgrounds with them is so fun and easy! 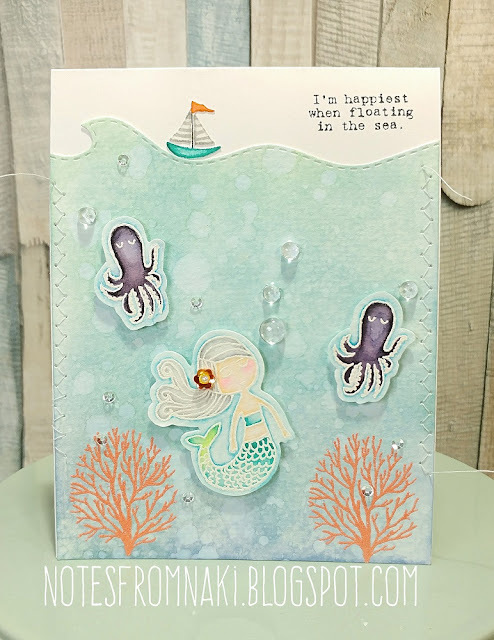 This adorable Mermaid and two octopi were heat embossed with white on watercolor paper, water colored with Zig Clean Color Real Brush Set. I gave my mermaid gray hair! I dressed her up with that little flower sequin and a tiny pearl inside of it. I borrowed the coral image from the Under The Sea set (also from Flora and Fauna), heat embossed with Calypso Coral. They really pop against all the blue and green, don't they!? I am loving the little sentiments that come with the set, the old typewriter font is just lovely! 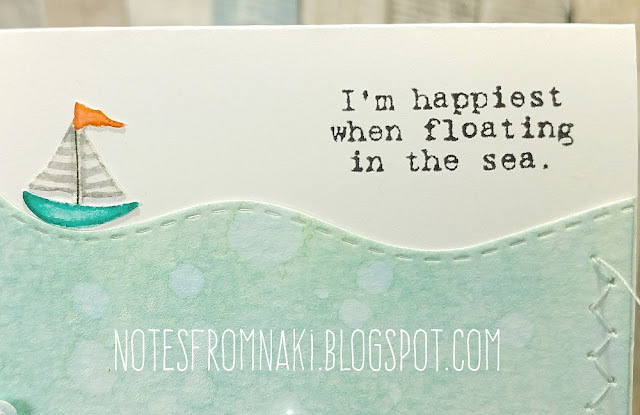 I die cut the top of my sea panel with the Sea Border Die Set from Newton's Nook Designs and added that cute little sailing boat on top. The boat was stamped with Smoky Gray on watercolor paper, water colored with Zig Clean Color Real Brush Set, and fussy cut. I'm loving the little stripes on the mast! Did you enjoy the reveal of the new release this week? 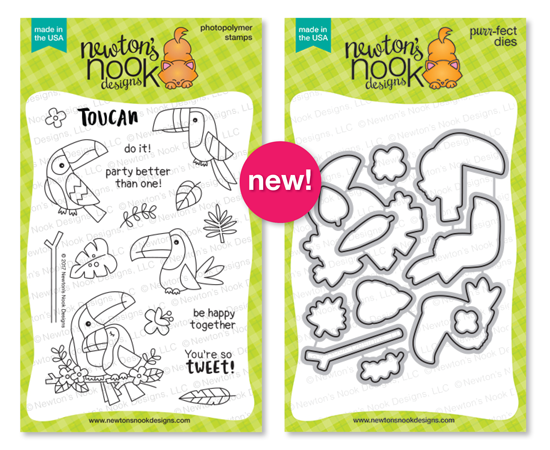 All the new products are now available for purchase over at the Newton's Nook Designs Shop! Woo Hoo! The 4 year celebration isn't over yet! 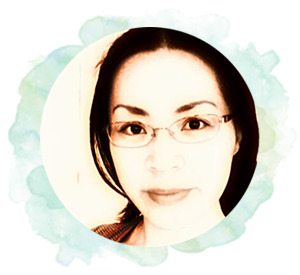 Today, not only we're blog hopping, we also have a gorgeous line-up of special guests! Are you excited as I am now!!? These beautiful, colorful birds are so festive and fun, just perfect for the celebration! Gold glimmer sentiment, gold striped washi tape, gold thread, and sparkling clear sequins add so much more fun to this card, don't you think!? 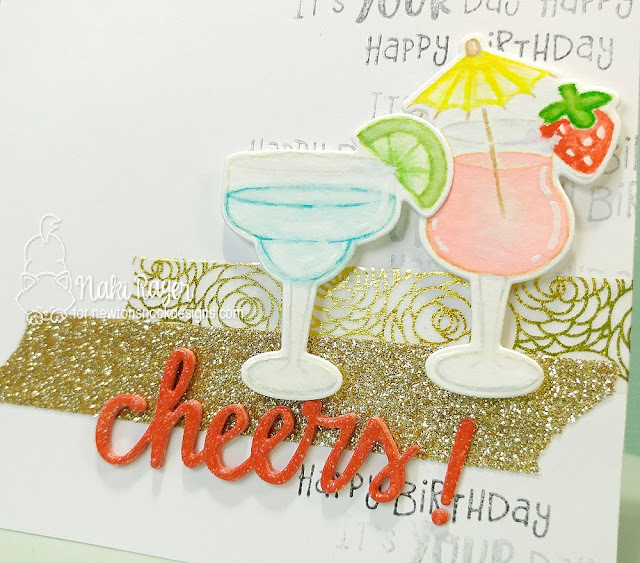 Blog hop and giveaway aren't the only way you can celebrate with us! Welcome back to the Newton's Nook Designs 4 Year Celebration! 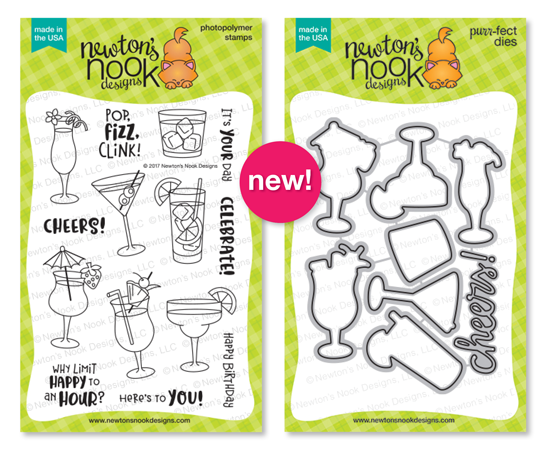 All the new products will be available for purchase tomorrow Friday the 14th over at the Newton's Nook Designs Shop! Isn't this so very excitingly adorable!!? We all know that this lucky little kitty travels all over the world, and this month, he is going to the outer space! FAR OUT! 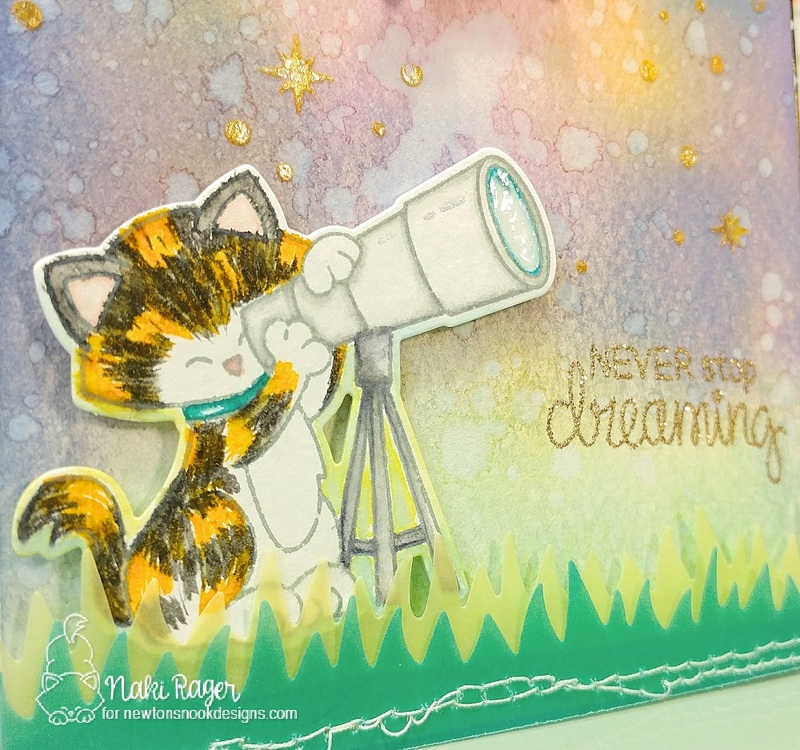 I just LOVE this stargazing kitty image! It's just so adorable! 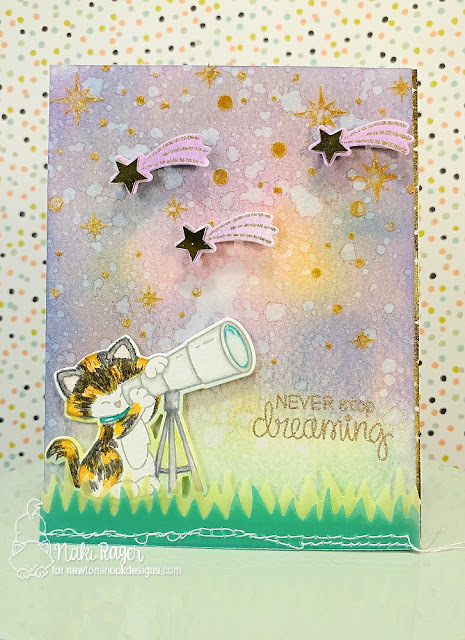 I couldn't resist but to create a night sky filled with twinkling stars, which I used Distress Oxide Ink, some water splatters, and the Starfield Stencil with the Metallic Gold Embossing Paste ;-) To add more sparkle, I heat embossed 3 shooting stars with gold embossing powder, and gold washi tape with white stars on the side. My kitty was stamped with Smoky Slate on watercolor paper, watercolored with Zig Clean Color Real Brush set, and die cut with the coordinating die. A little bit of Glossy Accent was applied where the lens is, I love that little bottle of sticky goo! The grass was die cut from the green and yellow vellum with the Land Borders Die set and sewn together, then popped on over my kitty with 3D clear tape. 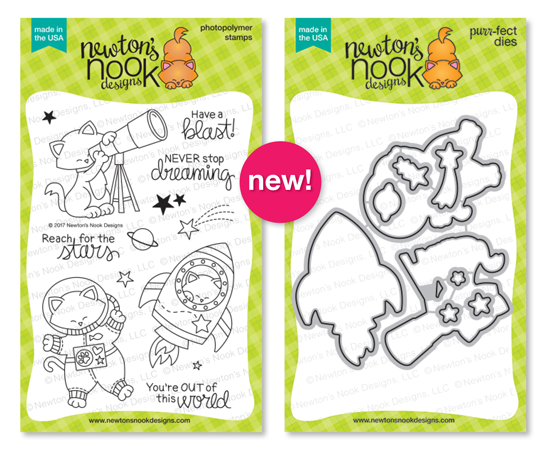 Apparently, stargazing wasn't enough for Newton so he has become an astronaut! The background was sponged with Distress Oxide ink, some water and copper ink were splattered, and heat embossed one of the stars from the Starfield Stencil with Metallic Copper embossing powder. Look how cute he is in his little space suite! He was heat embossed with Smoky Slate on watercolor paper, water colored with Zig Clean Color Real Brush Set, and die cut with the coordinating die. I added some glossy accents to his helmet. 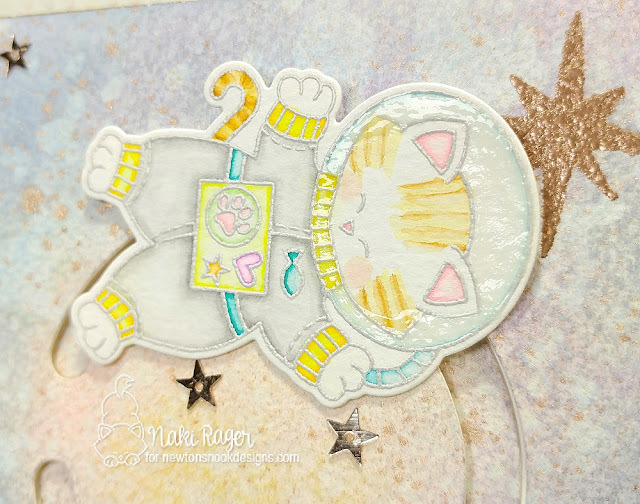 So this cutest little astronaut orbits! Isn't it so much fun!!? 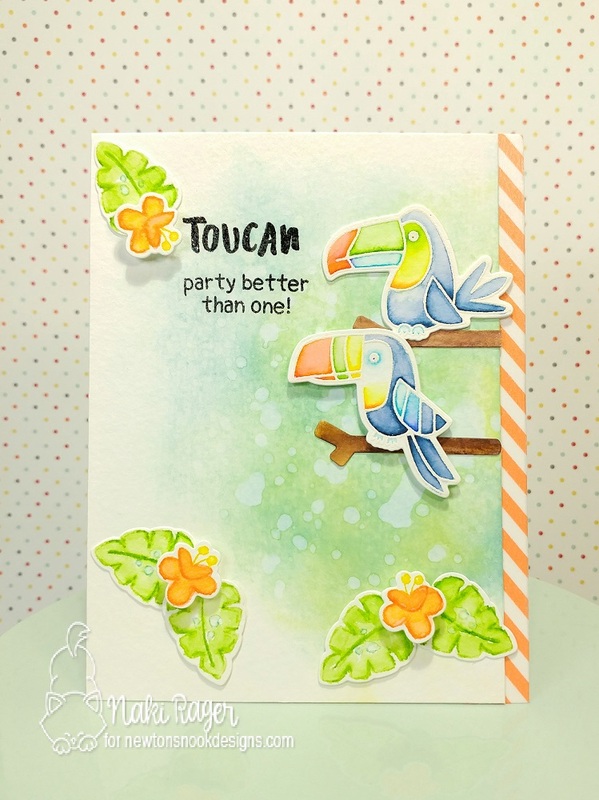 Today is day 3, and we're showcasing the Toucan Party Set along with the coordinating die set! 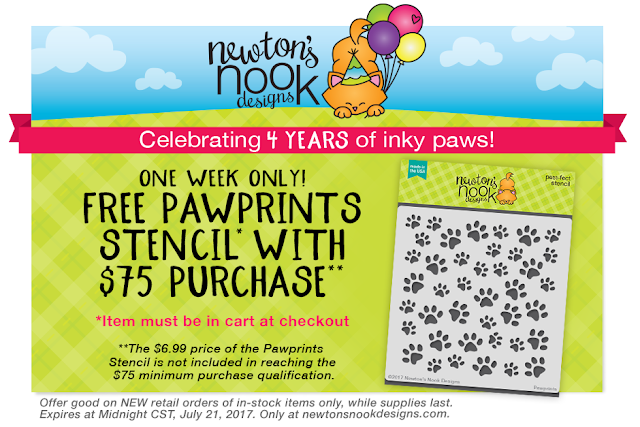 All the new products will be available for purchase this Friday the 14th over at the Newton's Nook Designs Shop! 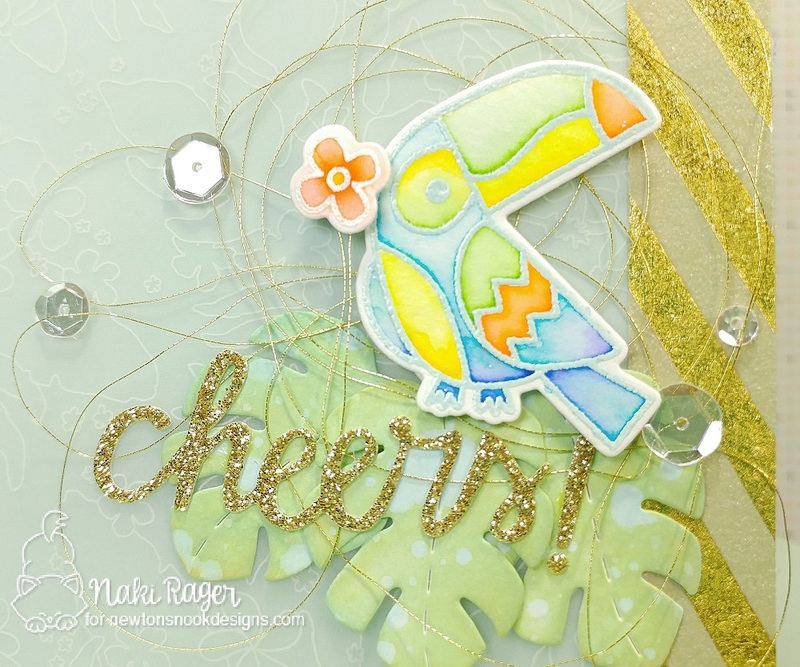 How stinkin' cute are these little birdies!!? My first card with this super fun set! I knew they were colorful and beautiful, but WOW! Talk about inspirations! 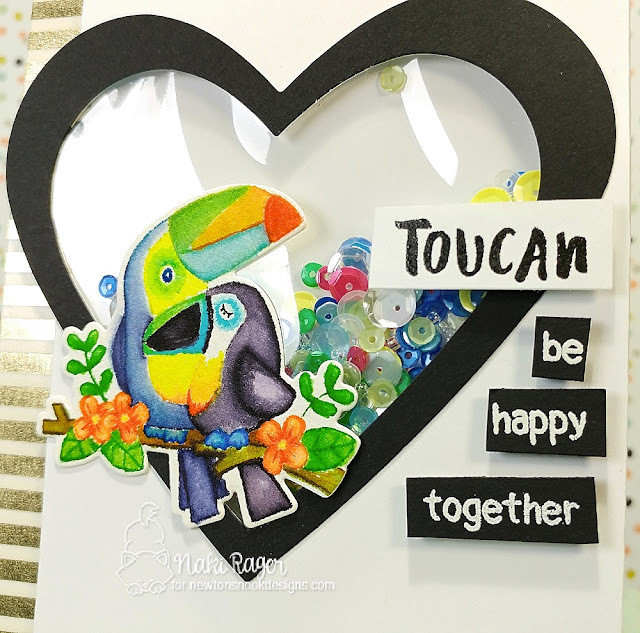 I chose this cute couple of toucans ;-) I mean, how can you not ink up this sweet image!? And this sweet pair needed to be watercolored, no-line watercolor to be exact! It was a lot of fun coloring these cuties, but I really had to be careful not to make it muddy! With all these bright colors, I thought the rest should be kept quieter, and black and white seemed like the perfect choice! 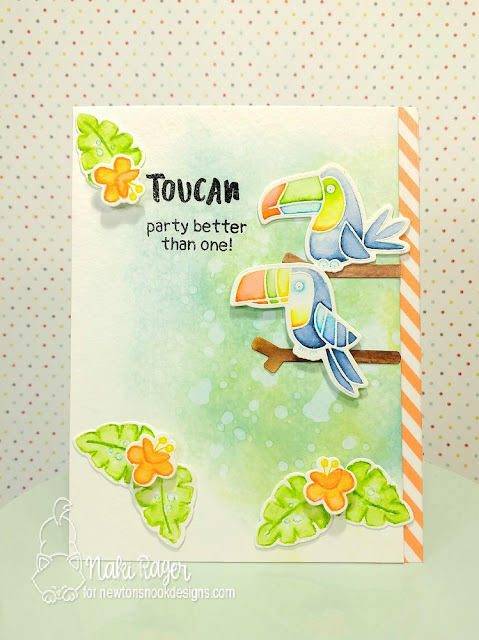 Here is my second card with the Toucan Party set! We have one more reveal day left, so do come back! We are on day 2 of the reveal, and showcasing 2 new fun sets today! They will be available for purchase along with the rest of this month's release this Friday the 14th over at the Newton's Nook Designs Shop! Jen even added a sentiment die! eeeeek! 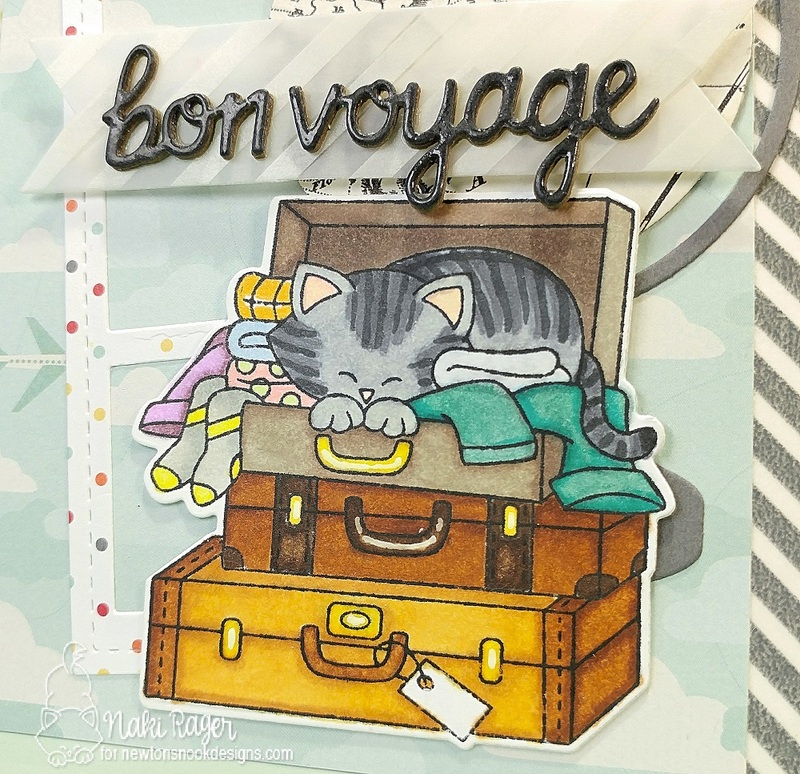 This one is called Stowaway Newton, simply adorable! 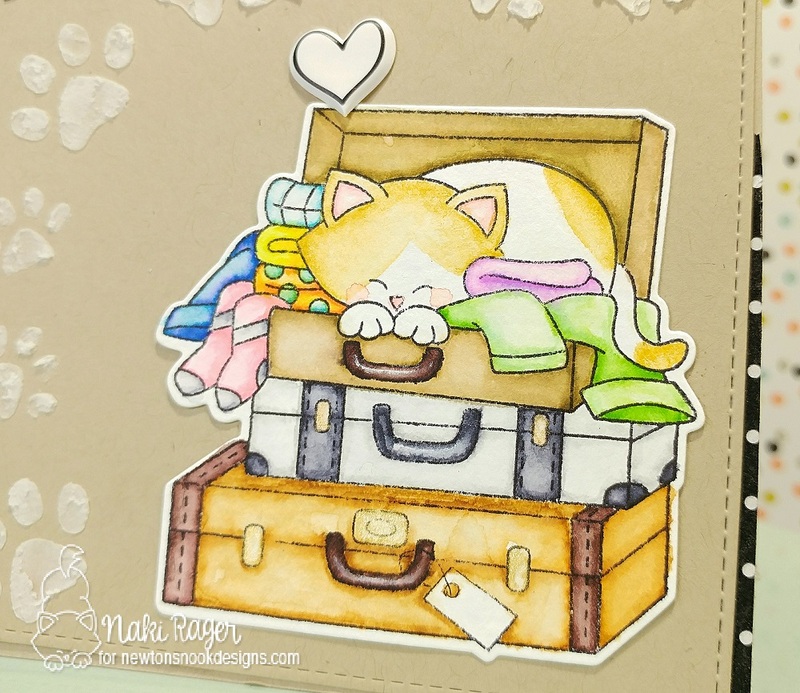 Newton does travel all over the world so it makes complete sense to have him pack his luggage, right!? And again, because Jen is so awesome, she added a sentiment die! 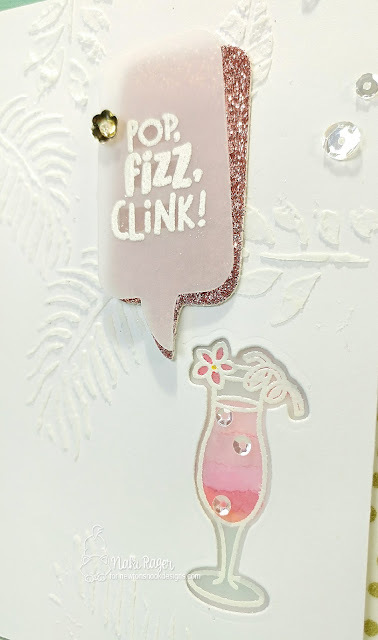 My drink was heat embossed in white on vellum and colored with several shades of pink markers, I die cut to create a window using the coordinating die, then placed the pretty pink drink behind it. 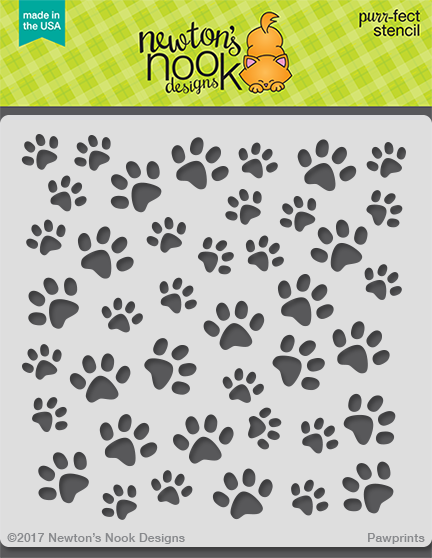 Isn't this stencil just beautiful!!? 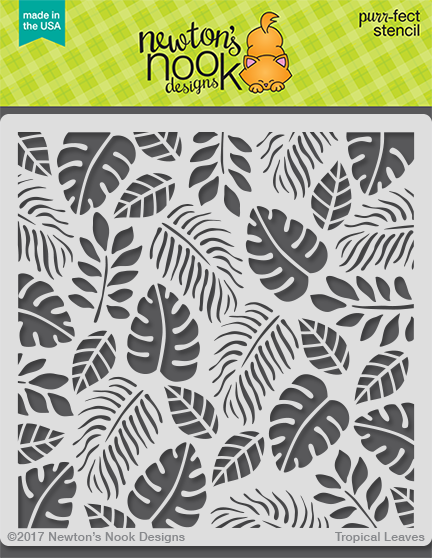 This would add so much fun to your summer or tropical projects! 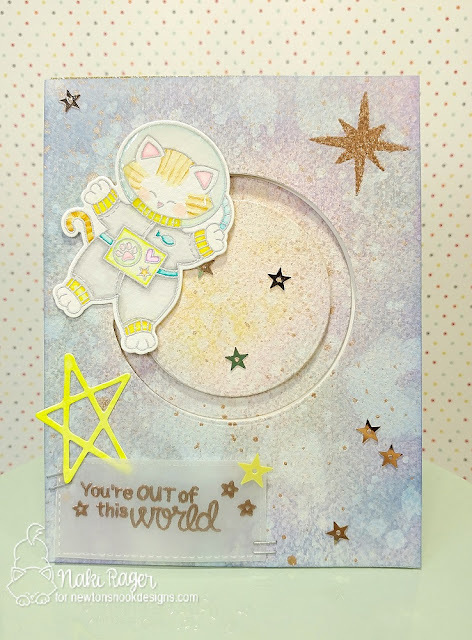 I stamped 2 of the sentiments from the set repeatedly on the base card. Two drinks were stamped with Antique Linen Distress Ink on watercolor paper, watercolored, and die cut with the coordinating die. 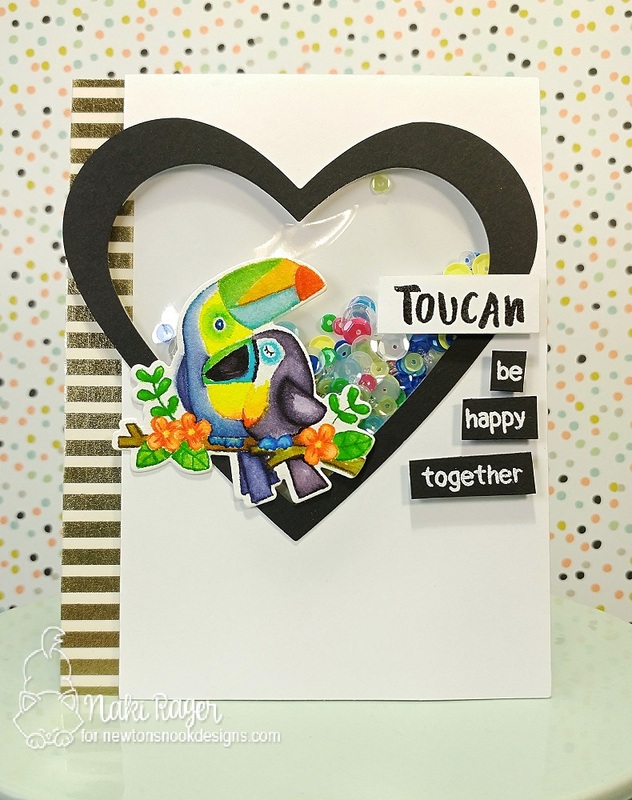 I also used the sentiment die from the same set. I layered 3 of them, the top one was heat embossed wit iridescent embossing power. This adorable, adventurous image was stamped with Black Soot Distress Ink on Neenah White Cardstock, colored with Spectrum Noir Markers, and die cut with the coordinating die. 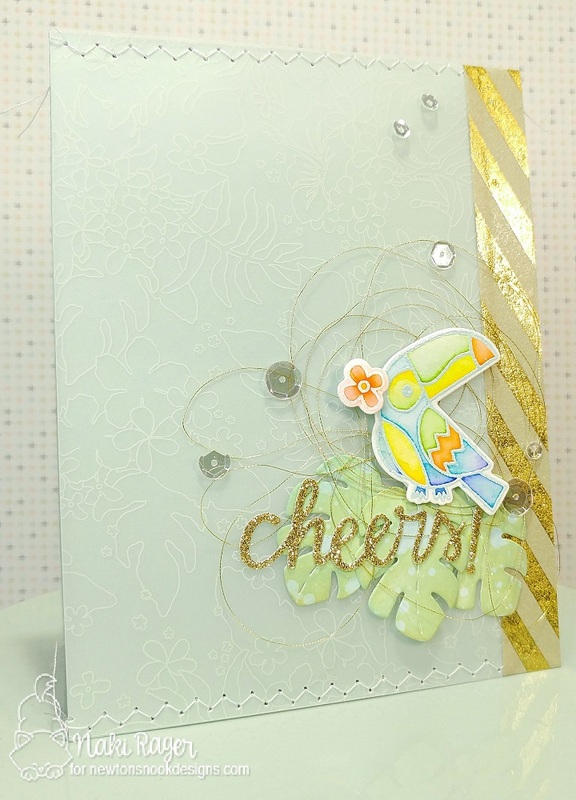 Of course I had to use the sentiment die, which 3 of them were cut and layered. The top one was heat embossed with clear embossing powder. This sentiment "Oh, the places you'll go!" inspired me to make this one! Isn't this just a must for us Newton lovers!!? 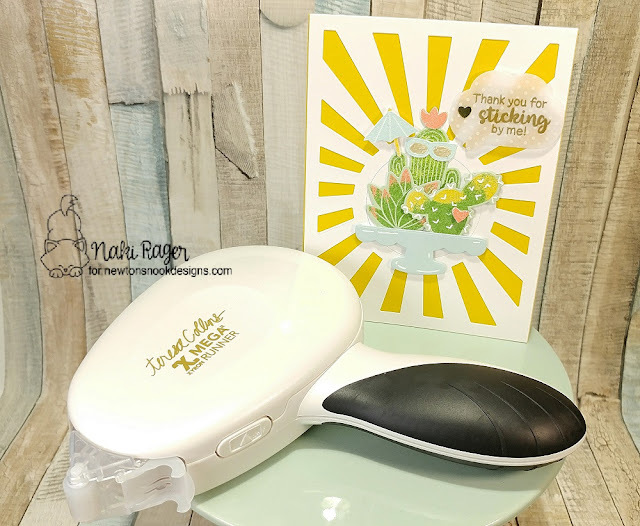 This time, the image was stamped with the Ranger Archival Black Ink on watercolor paper, watercolored with Zig Clean Color Real Brush Set, and die cut with the coordinating die. 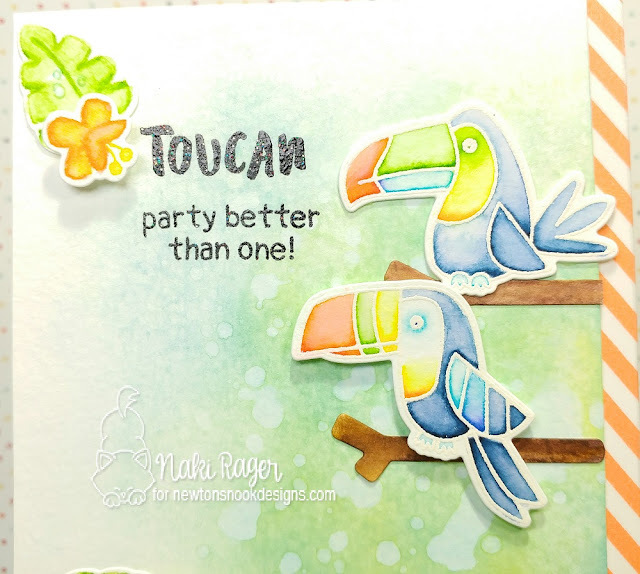 I tried to color with other than watercolor with this release, but I have to be totally honest with you, I am so comfortable with watercolor, and just love the look of it, too! 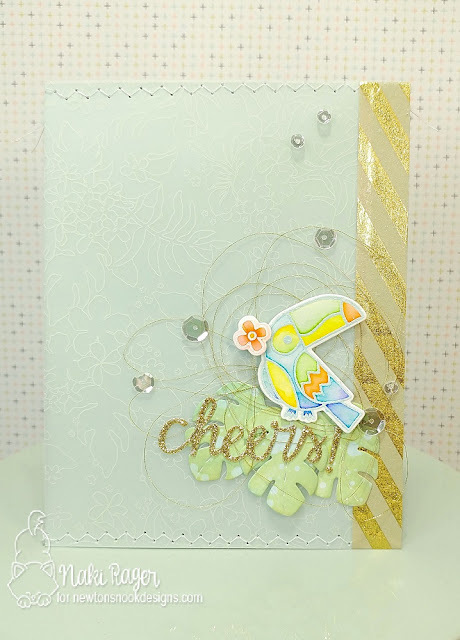 Tomorrow's reveal will make you squeal for certain, so make sure you come back!